Hostpapa is a Canadian based web hosting Provider. They currently hosted more than 500,000 websites and specialize in offering low-cost, no-frills Shared Hosting, VPS Plans, Email Hosting, Reseller Hosting. Hostpapa is the ideal choice if you are a personal or small to medium size business. Read the full Hostpapa review to find out why? HostPapa is a web hosting company that was founded in 2005. A lot of citizens that reside in Canada are very interested in their services. They are Canadian based company and do have a fairly great client base. There are more than 500,000 websites hosted on their servers. While they have only been in hosting business for less than a decade they are one of the fastest growing web hosting companies. But, what are experts and other webmasters opinion about their experience with them? They attract a lot of small to mid businesses as well as resellers because they offered those type of hosting plans. Another main selling point with Hostpapa is you are going to get highly expert “World Class” customer service, and they are eco-friendly because they are specialized in green hosting so you are helping the environment by selecting their service (like iPage). Hostpapa’s data center, located in Toronto, has a 24*7 security setup. Additionally, the data center uses high power diesel generators as power backups with round the clock network monitoring service. HostPapa backs up its servers on regular basis in the event of a system failure. Although, these backups are only available to the company only. However, the company advises its clients and users to often back up their websites to be ready for any incident. All the Hosting Packages are reasonably priced and in line with industry standards. You can get started for just $3.95/mo. When the promotional offer expires, the Starter plan costs just $5.99/mo. All plans feature $200 marketing credits and unlimited bandwidth. Free Domain with every hosting package. The Starter plan is missing many features which are comprised at the pro tiers, but you also have the choice of buying those features separately as add-ons to your hosting plan. You get a free website builder tool included with your plan. A broad variety of applications and tools are supported for blogging, Video’s, images, Wiki, polls, and much more. eCommerce features are available with every package. Multi-language Customer support is available via telephone, live chat, ticket system and e-mail. 30 days unconditional money-back guarantee on all plans. $200 worth free marketing credits add value to your plan. This is especially helpful for small business website or a web shop. Starter: $3.95 monthly, Regular Price $5.99/month. Business: $3.95 monthly, Limited time offer, Regular Price $9.99/month. Business Pro: $12.95 monthly price, Regular Price $18.99/month. With the Starter plan, you are allowed host two websites. With the Business or Business Pro packages, you can host unlimited website. With start plan, you get 100 GB of web space. Unlimited Disk space is available at the top two tiers. With all three shared hosting plans, you get unlimited bandwidth/transfer, free domain name registration, and FTP access. All plans also contains free email id’s and security features such as a server firewall and Monitoring & Intrusion Detection. If you would like automated website backups or looking for a SSL certificate, you will need to invest some extra at the lower two tiers. These amazing features are anyhow included at the top tier package. All of the apps and e-commerce features are included free of cost at all three packages. VPS-Plus: $19.99/mo. to start with, Renews at $49.99/month. VPS-Pro: $39.99/mo. to start with, Renews at $79.99/month. VPS-Premium: $109.99/mo. to start with, Renews at $149.99/month. All plans levels contain 2 IP addresses and Unmetered bandwidth, as well as easy to use cPanel/WHM. You will get 4 cores of CPU power at the Plus level, and 8 cores CPU power at the Pro and Premium levels. RAM (Server Memory)starts at 1.5 GB and goes as high as 6.0 GB. Web space starts at 50 GB and goes up to 200 GB at the top tier. All plans include $200 worth free marketing credits. By offering feature-rich reseller web hosting services, HostPapa helps make people’s businesses quite comfortable and profitable. With this service, people are permitted to make complete use of those extremely useful features and tools to resell the hosting services to own customers, under their own brand name. HostPapa offers various reseller hosting solutions, which comes with different features, i.e 50GB to 200GB webspace space, 500GB to 1.4TB bandwidth, unlimited websites allowed on one reseller account, 3 IP addresses, free control panel, free billing software. HostPapa data centers have all security features as its rivals. HostPapa has all the security features and tools you can’t imagine to protect the equipment and the premises. Their data centres are furnished with total climate and temperature control, raised floor facility, fault/error protection, security, fire-suppression systems, water detection systems, uninterruptible 24/7 power supply (UPS), standby and redundant power generation, and diesel backup generators. 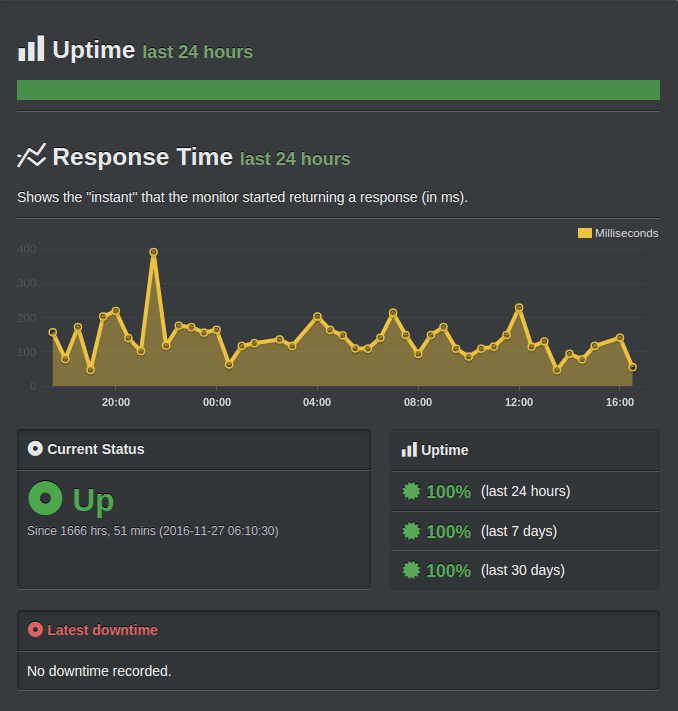 As a result, the tested and monitored server uptime of HostPapa is nearly 100%, with only around 10 minutes down in a month. HostPapa web hosting services are really reliable and trusted. HostPapa uses industry;s most reliable cPanel for the web hosting control panel. With the help of this icon based cpanel, you can easily manage everything about your websites, including MySQL databases, sub-domains, websites, data management, email accounts, PHP configuration etc. By combining with Fantastico, it gives more 50+ scripts that you can set up your website without worry, whatever it’s a discussion forum, web blog, image gallery, e-commerce, online store or content website. HostPapa does not customize their control Panel, so there is no difference to the normal cPanel provided by other Top Web Hosting Companies. HostPapa backs up it’s all services with a 30 day money back. If you cancel your account any time during the first 30 days of service, you can get a full refund, you will not get one-time fees involved in your order. Such a fee is e.g. the free domain registration, account setup etc. that’s not free if you cancel your web hosting plan. HostPapa provides 24/7 customer service via toll-free telephone, live chat, email system, knowledge base and support ticket system. As our team members interviewed with them thrice through phone call and live chat. Their telephone support is easiest way to connect with, and their staff members always politely reply your queries and help you resolve the problems. HostPapa provides support in multiple languages, in English, French, Spanish and much more. Furthermore, they all offer video tutorials and a wide database of FAQs (Frequently asked questions). HostPapa may be a better option if you are looking for a simplest, easy-to-use hosting solution which is low-cost, budget-friendly and ideal for beginners handle small websites.